As craft beer’s first equipment financing company, we want our customers to know about the best gear available. Here’s a piece on the new Squarrel, one of the more innovative creations we’ve seen. We can easily finance these for brewers, distillers and others looking to expand their wood-aged offerings. Even in an industry that thrives on never-before ideas, the term “revolutionary” can still get overused. But in the case of the Squarrel, the term is fitting. The novel steel & wood vessel strips the centuries old barrel of its namesake shape, and replaces it with a square and stackable steel frame filled in with flavor-enhancing wood staves. The Squarrel was released this past spring in a 10-gallon size, and 30-gallon and 60-gallon sizes are on the way. The vessel can be equipped with three types of oak slats (French, American or Mongolian) that come in various levels of toast and char. Unlike wooden staves dropped in a fermenter, Squarrel staves provide the exchange of oxygen that takes place in an actual barrel. So brewers get authentic barrel-aged charm, and in fast fashion. The company says Squarrels impart wood character 8 to 10 times faster than a standard barrel. Squarrel offers staves cut in the typical along-the-grain fashion, and makes end-cut staves that speed up the transfer of wood flavors. All of the staves are notched in various fashions to increase the surface area contact between beer and wood and accelerate flavor transfer. For a custom wood-aged process, brewers can equip Squarrels with a mix of the various stave options. The company is also experimenting with staves inoculated with wild yeast and bacteria that enable brewers to create wild and sour beers with Squarrels. Ready for your own family of Squarrels? 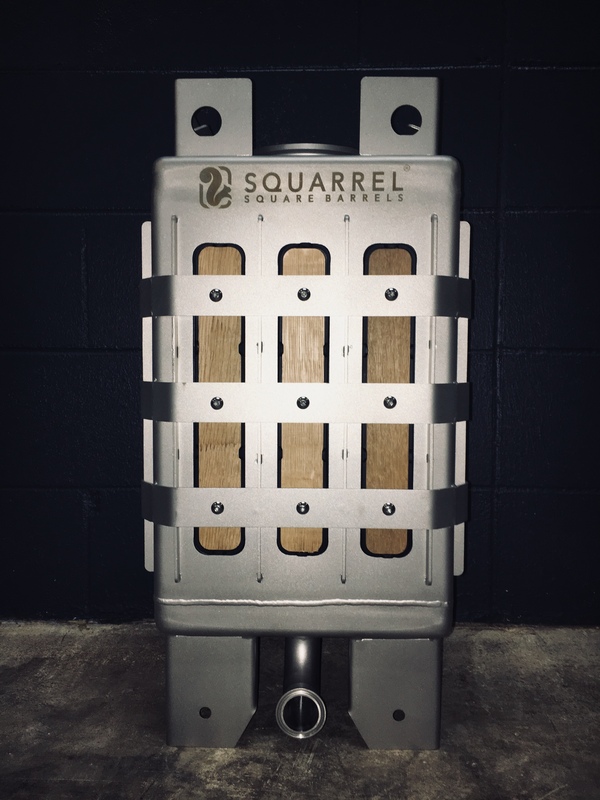 They range in price from around $700 (10-gallon size) to about $1200 (60-gallon size) and Brewery Finance can have your Squarrels in your brewery in just a few days. Give us a call to make it happen.